An adoring fan gets the youth movement started. In case you missed Dar Williams’ concert in King of Prussia over the weekend, check out my review at CultureMob Philly. The girls were pretty awesome, there’s no doubt. And I, for one, welcome our new diminutive overlords. I am the mom of the 2 yr old in the orange dress who danced the whole time. Do you have any pictures/video? I added a photo of her to the post. Because of her age, I didn’t want to use an image with the original post. She was awesome and big props to you for keeping an eye on her for most of the concert. I bet all of the dancers slept well that night! awesome- thanks…would you be able to email me the picture as well (and any others if you have them…thanks so much! Shawn, I work with Joanne. Joanne, I used to work with Shawn. Small world, huh? Or just a world with far too few Dar fans, maybe. Shawn, Joanne is not a creeper trying to steal pictures of a cute kid in an orange dress. She is too legit to quit. P.S. 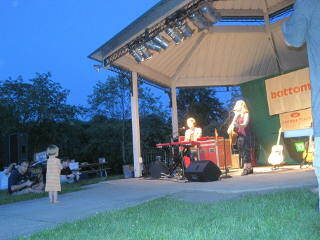 Shawn, remember when Molly was maybe 20 months old and rocked out at Dar? Totally! Molly was dancing at the concert as well, in a sort of Irish jig way. What a small, small world! I sent Joanne the pictures. I figured she was on the up and up since she asked about such a specific element of the show.